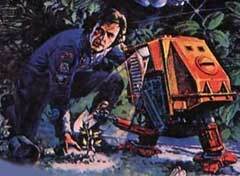 Remarkable similarities between the new Low End Mac mascot, Lemmy (see last week's Marketing Campaign Bombs in Redmond), the three maintenance robots, Hewie, Dewie, and Lewie from the 1971 sci-fi film Silent Running, prompted an announcement today. The robots said that they are investigating possible litigation against Lemmy and Low End Mac. Lawyers for Low End Mac were quoted as saying, "We feel that there are substantive differences between the Silent Running robots and Lemmy. For one thing, Lemmy doesn't require chimpanzees* to make him appear animated. For another, he doesn't take his orders from Bruce Dern." The chimpanzees were unavailable for comment. No chimpanzees were used in the robots. Instead, multiple-amputee actors made the robots work.